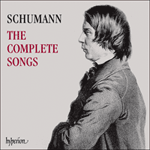 Why and how Schumann decided to embark on this cycle has been explained in the introduction. One may picture the teenage poetess dressed as something between a nun and bride, and old before her time, like so many children of the nineteenth century who were groomed as geniuses. Schumann had long shown his interest in, and sympathy for, childhood and its musical depiction. He had been a lifelong admirer of contemporary poets. Indeed his admiration for such figures as Lenau and Hebbel, not to mention Goethe, was nothing less than reverential. When he came across the poems of a child, these enthusiasms were united, although Elizabeth Kulmann had already been dead for a quarter of a century. And it was also of emotional importance to Schumann that Kulmann was a girl: the composer was a fond father of daughters (though it is noteworthy that of his children only his son Felix wrote poetry) and his study of the character of Goethe’s Mignon (who also died young) predisposed him to see the pathos of her story in terms of femininity and unfailing dutifulness. The same impulse, admiration for what he might have termed, along with Goethe, das Ewig-Weibliche, had drawn the composer, via Clara of course, to Chamisso’s Frauenliebe -und leben. Even if the vicissitudes of marriage had taken their toll on the relationship between husband and wife, it is as if the composer were continually searching for a heroine on whom to lavish his worshipping admiration. This may further explain Schumann’s fixation on Kulmann, as well as his empathy with the tormented life of Mary Stuart. In comparison to the von der Neun settings, here is all transparent simplicity. The pretensions of orchestral accompaniment are swept aside and the homely piano is reinstated in the parlour. The texture is childlike, and one thinks of some of the enchanting songs from the Op 79 Liederalbum für die Jugend, no less effective for their sparse accompaniments and folksong-like melodies. Schumann had already set the words of a handful of female poets (Lily Bernhard, Catherine Fanshawe, Wilhelmine Lorenz and Marianne von Willemer) but here, for the first time, he sets his cap at a style suitable for feminine poetry. This is a subtly different concept from finding a style for songs about women; indeed, as an equivalent, one thinks of the conscious decision of Francis Poulenc, ninety years later, to find an appropriately feminine musical language to suit the poems of Louise de Vilmorin. Like Schumann, Poulenc conceived his Vilmorin songs (Fiançailles pour rire) as a result of an empathy not only with the poetry itself, but with the biographical circumstances surrounding it. Dedication These unpretentious songs are dedicated to the memory of a girl who departed from us long ago, and whose name is known to very few. And yet she was one of those wondrously gifted beings who appear only very rarely on earth. The sublimest teachings of wisdom, expressed here with the utmost poetic perfection, come from the lips of a child; and it is in her very poetry that we read how her life, spent in quiet obscurity and the greatest poverty, became richly happy. These few small songs, chosen from several thousands, of which only a few lend themselves to composition, cannot give even an approximate notion of her character. Though her whole life was one of poetry, only a few moments from this rich existence can be selected. Pour la première et unique fois, Schumann présente son cycle avec une dédicace écrite («Widmung») concernant la jeune poète inconnue, une russe germanophone, et le conclut par un postlude—les lieder sont également introduits individuellement par quelques lignes écrites—tous ces mots de la main du compositeur sont lus ici par Juliane Banse. La musique est essentiellement dans le style du Lieder-Album für die Jugend, à l’exception peut-être du cinquième lied plus complexe, Reich mir die Hand, o Wolke. C’est le début d’une nouvelle veine dans l’écriture mélodique de Schumann: il semble surtout témoigner de la sympathie envers les victimes de tragédies et de malheurs. Ayant lui même des filles jeunes, il ressent de la tendresse pour Kulmann et son talent incroyablement facile—aucun de ses propres enfants n’était particulièrement créatif (à l’exception peut-être de Felix qu’il n’a jamais connu). Il éprouvait en outre beaucoup de compassion parce qu’elle était morte très jeune. À cette époque, il semble que le compositeur se considérait aussi comme un personnage tragique, un artiste comme Kulmann qui ne pouvait donner toute sa mesure à sa pleine créativité à cause de la maladie. Zum ersten und einzigen Mal stellt Schumann seinem Zyklus eine Widmung voran, und zwar an den unbekannten Dichter, einen Deutsch sprechenden Russen, und schließt mit einem Nachspiel (auch die Lieder werden einzeln vorgestellt, und alle diese Zeilen aus der Feder des Komponisten werden hier von Juliane Banse gesprochen). Die Musik ist, mit der möglichen Ausnahme des etwas komplexeren fünften Lieds Reich mir die Hand, o Wolke, überwiegend im Stil des Lieder-Album für die Jugend gehalten. Dies ist der Beginn einer neuen Phase in Schumanns Kompositionsstil für Lieder, wobei er vor allem mit Opfern von Tragödien und Unglück zu sympathisieren scheint. Als Vater kleiner Mädchen entwickelte er sicherlich zarte Gefühle für Kulmann und ihren erstaunlichen Talentfluss (keines seiner Kinder war auffällig kreativ mit Ausnahme vielleicht von Felix, den er nie zu Gesicht bekommen sollte). Außerdem empfand er deutlich großes Mitleid mit ihrem frühen Tod. Um diese Zeit verstand Schumann sich auch selbst als tragische Figur, als einen Künstler wie Kulmann, dem Krankheit verwehrt, seine ganze Kreativität auszuschöpfen. die Letzteren in den Schlachten der Jahre 1812–14. die sie mit zärtlicher Liebe bis an ihr Ende verehrte. Wie schaust du heut’ so blass? Vielleicht dir krank nach Haus? Weinst deinen Schmerz hier aus? Hat mich nur jetzt um sich! Vom Ort ich ihrer Ruh. Und kannst nicht stets dich freun! the last on the battlefield during the wars of 1812–14. whom she revered and loved until she died, survived. that were addressed to her mother. Why do you look so pale today? To weep out your sorrow here? Fate has befallen me too. With only me now to tend her! Seeking strength for my heart. And cannot always be happy! The music seems shorn of all pretension. The voice, as in this song, often begins without the ceremony of an introduction. The key is G minor which, together with its relative major of B flat, governs all but the last song of this little cycle. The time signature is a modest 2/4. For the first two verses (treated strophically) the mezzo staccato chords in right-hand quavers alternate with a simple cello-like line in the bass. Even when the melody changes and wanders waywardly for the third and fourth strophes, the accompaniment remains modest, often hugging the vocal line in demure fashion. The transparent texture seems suitable for moonlight, and the tone of filial piety with which Kulmann describes caring for her sick mother successfully avoids the sickly-sweet or sentimental. The change into the major key for the last verse is a predictable analogue for consolation. This last verse is a variant of the opening music without being a repeat of it. A casual first hearing might have diagnosed a more simple form for this song than is actually the case. For better or worse, it is clear that the composer has lavished considerable care on giving the music the appearance of childlike naivety. No 2: Viel Glück zur Reise, Schwalben! an unzähligen Stellen preist sie die Schönheiten des nordischen Himmels. Das folgende Gedicht ist ein Beleg dazu. as the following poem illustrates. The time-signature of this delectable little song is once again 2/4; the key is B flat major. Delicate demisemiquaver figurations ripple up the stave, delineating the flight-path of the swallows on their way to the warmer south. But this music flits rather than floats, and the autumn departure is enlivened by a spring in the step. On the second beat of each bar a staccato bass note is followed by a crisply exuberant chord (also staccato), high in the treble, which pings like a tambourine. This foot-tapping Bewegung, sustained more or less throughout the song, suggests a dance. In Der Hidalgo (in Volume 2) Schumann had used polonaise rhythm to stand in for a Spanish bolero: Spain and Poland seemed equally distant and exotic. At first one might imagine that the composer had intended to suggest a Russian dance of some sort in honour of Kulmann’s (and the birds’) patriotism; but in the end this music also invokes Schumann’s Spain, and the 2/4 music for O wie lieblich ist das Mädchen and its corollary Weh, wie zornig ist das Mädchen from the Spanisches Liebeslieder. This may seem puzzling at first. Kulmann’s ‘die tausend Wunder, die darbeut jedes Reich’ leaves the birds’ travel agenda wide open; but Schumann has seized on the idea of the ‘schönen warmen Süden’, and where else but Spain? The poet makes the point, admired by Schumann, that the swallows, in returning north after their southern migration, would remain loyal to their homeland. Kulmann would like to go with them, but would also remain a loyal Russian. In the meantime, however, the birds are holiday-bound, and the song is an excited musical postcard of their imagined travels. They will return home with Spanish suntans, and legs tired with dancing. das folgende Lied ist eine Antwort darauf. Du irrst, ich bin nicht arm. Sein Dach ist reines Gold! the following song is her reply. You are wrong, I am not poor. Its roof is pure gold! The unselfconscious gaiety of the second song now yields to something approaching pathos. The tonality reverts, predictably, to G minor. If we no longer share the Victorians’ taste for the moving testimony of disadvantaged people stoically insisting on their happiness (in the manner of much in Dickens, designed to bring a tear to the eye) we must blame the Zeitgeist. Here Schumann writes his equivalent of Schubert’s Der blinde Knabe, Colley Cibber’s poem about the blind boy who is pathetically grateful for small mercies and asks plaintively ‘What is this thing called light?’. The song opens with the freedom of recitative that provides a dim echo of the speech-like opening of Süsser Freund from Frauenliebe und -leben. Eight bars of gentle reproof to an imaginary interlocutor are followed by a new section in E flat major marked ‘Lebhafter’ – a quickening of pulse as Kulmann describes her blessings. As if to negate the topography of ‘niedres Hüttchen’ the vocal line soars upwards as the harmonies move into the ever warmer regions of the flat keys for ‘die Sonne hold’. The concept of the purity of gold (for the hut’s roof) returns the piano arpeggios to the unadulterated reiteration of E flat major. And then faster still (Schneller), and the accompaniment begins to pant in triplets; sunset seems an inappropriate moment for such heightened activity, and the composer soon winds down the tempo for a return to ‘Du nennst mich armes Mädchen’. It would be charitable to Schumann to suggest that the awkwardness of this music was his deliberate attempt to depict a teenage girl obliged to defend herself against demeaning pity, confident and embarrassed in turn. vielleicht schon im elften Jahre gedichtet. So reizend naive enthalten die Dichtungen jener Zeit an die Hundert. Auf das tiefste spiegelt sie überall die Wirklichkeit ab. perhaps in her eleventh year. Hundreds of other poems written at this time are similarly naive and charming. She always reflects reality in the profoundest way. Time and again Schumann proves himself a devoted naturalist. Flowers figure everywhere in his output, and his song menagerie includes lions, a butterfly, a ladybird, and a couple of old steeds. His aviary is even larger: it contains birds of every description from predatory ravens to a cute little owl. This finch is not the least enchanting of his creations and, as Eric Sams points out, if it had been a part of the Op 79 set of children’s songs, we would be better acquainted with it. Schumann is tickled pink that Kulmann was very young when she wrote the poem; he finds a miniature time signature, 4/16, which seems perfectly tailored to the smallness of the song and its creator. The idea of a singing contest (‘Wettgesang’), however informal, between child and bird, is charmingly caught by the fragments of canon and imitation between the vocal line and the accompaniment. This is the epitome of deftness and delicacy, the separate double-tailed semiquavers on the stave suggesting a feathery line-up of individual finches. The spiky birdlike Bewegung is reminiscent of the charming birdsong duet Das Glück (Hebbel), another exercise in competitive canon, which was to make a reappearance in the opera Genoveva. The song is marked Da Capo ad libitum, and it is our pleasure to re-run the contest. beschäftigt sie sich visionsartig mit ihren Hingeschiedenen. die ihr auf ihrem kurzen Lebensweg begegneten. Aber es ahnt ihr, dass sie sie bald verlassen muss. Heb mich zu dir empor! Sie winken mir zu sich. she concerns herself here with a visionary depiction of her deceased family. she meets during her brief stay on earth. But she has a foreboding that she will soon have to leave them. Lift me up to you! At the open gate of heaven. I see our father too! They beckon me to their side. Quickly, quickly raise me up! There is an immense difference in emotional scale between a merry and successful ditty about a finch and a song where the poetess, imagining her dead relatives in excelsis, expresses a wish to join them there. The poem seems an uncomfortable choice for a cycle of miniatures: the composer obviously wishes to write songs of childlike simplicity and purity, and yet he chooses a poem which seems maudlin and shamelessly manipulative. (One is reminded of the Victorian ballad which begins ‘Give me a ticket to Heaven; that’s where Dad’s gone they say’). This reaction may seem cynical, but even by nineteenth-century standards Schumann’s unquestioning credulity stretches belief. It is hardly surprising, then, that Reich mir die Hand, o Wolke, extremely short for the emotional range of its subject matter, fails to rise to the occasion, much less to lift the poetess to heaven on wings of song. If the ageing Schumann has truly invented a new type of Lied, as supporters of his late style aver (and I am one of them on occasion), one would search in vain for evidence of this here. The text seems not even to have inspired the composer to new thoughts. As Eric Sams has pointed out, the music is a re-working of Gesungen! the von der Neun setting heard earlier on this disc. The singer is allowed to sound fervently sincere; the pianist’s left hand makes much of stretching a tenth (and, on occasion, even more) as if to reach out for the young girl’s hand in response to her pleas; the incessant semiquaver movement generates drama of a kind, though of a rather generalised nature. The postlude seems a pale echo of Der Himmel hat eine Träne geweint which quotes the opening of Giordano’s Caro mio ben in descending sequences. All in all, we weep for Schumann. The song tells us more about his depression and suicidal tendencies than about his skill as a pioneer of a new Lieder style. wohl aus ihrem letzten Lebensjahr. in dem sie Jahraus, Jahrein, Blumen pflegte. Auch eine Pappel stand in der Nähe. Seh ich schon halb entlaubt. probably dating from the last year of her life. year after year she grew flowers. There was also a poplar nearby. Has long since gone to rest! No longer raise your head! Has lost half of its flowers. The style of this reverts to the transparent music of the opening song: the same 2/4 movement, and a texture that is depouillé to say the least. A choice of French adjective is apposite here because, not for the first time, one notices that late Schumann has a lot in common with the style of the late Fauré and a song-cycle like Le jardin clos. For those moved by late Fauré, the music seems more profound and deeply meant than ever; for others, the non-believers, it seems arid and uninspired, a sad case of creativity in decline. And there is some strange link between Fauré’s tinnitus and the head noises and repeated notes which tormented Schumann. The parallels between the two composers are clear enough not only from the partisan reactions of the enthusiasts and debunkers of their late styles, but also from the sheer sound of the late music. Die letzten Blumen starben is undemonstrative to the point of apathy, the compass of the melody confined, more or less, to the compass of a fourth. A similarly floral subject is treated with great lusciousness by Chausson (Le temps des lilas) but how differently would Fauré have handled it. Self-effacement will always have its fans, and Schumann’s, when he is in this mood, is slowly gaining its partisans. Where does ‘reserved’ end and ‘inarticulate’ begin? It was a question also asked by those who knew Schumann personally in the last years of his life. The accompaniment is economical, as if more notes would be disastrously expensive, and thriftiness a rigorous virtue. Within the confines of this three-verse structure (AAB) drained of effusive lyricism, a portrait of Elisabeth Kulmann emerges as someone no longer of this world, exhausted, and slowly dying, fading away like her garden. She accepts death with humility and equanimity. Schumann’s verbal introduction seems, in this song particularly, to be an integral part of the music’s effect. Wohl kurz vor ihrem Ende gedichtet. Probably written shortly before her death. This is the only song in the cycle which is in E flat major. After six songs in either G minor or B flat major, the effect is that of branching out in a new direction and moving away into something distant and unknown. The metaphor, more pagan than Christian, of the poet’s barque struggling through the sea and sighting at last a new horizon, brings a French comparison once again to mind. In the sea-and-sailing metaphors of Gabriel Fauré’s very last song cycle L’horizon chimérique, Kulmann shares with the poet Jean de la Ville de Mirmont (killed as a young soldier in the First World War) the vision of death as un grand départ inassouvi, the unappeased longing for a great adventure. Even the layout of the music on the page has a Fauréan appearance – a moto perpetuo accompaniment where groups of right-hand quavers glance off a strongly rhythmic bass; the music moves forward with scarcely a pause for breath, exploring various harmonic twists and turns. The melody, as if energised by a groundswell of current, seems more vital than in any of the preceding songs. If the approach of death is frightening, it is to be welcomed as a release from pain. There are moments of apt harmonic illustration – notably the strange augmented harmonies on ‘erzürnten Flut’ (denoting the turbulence of the water and suggesting that the ‘Flut’ has Styx-like attributes), the appropriate sideways step into D flat major on ‘vermeiden’ (‘avoid’), and the asides to the poet’s mother spoken in an attempt to comfort her. As an original, if unusual, piece of work, this seems superior to any of the other serious songs in the set (the charm of the two lighter songs is not in doubt). The postlude, with its yearning melody in the pianist’s little finger, seems to illustrate Kulmann herself – ever selfless, ever helpful – stretching out to new arrivals on death’s shore, and greeting them. Perhaps Schumann, who was to attempt suicide by drowning, imagined that the eternally young Elisabeth would be on hand to ease his faltering steps on to the promised land. He could not resist adding a postlude to the music in his own words. The song is printed in a way that makes it clear that the composer wishes the listener to be left to ponder his short eulogy which follows the music’s dying strains. Sie starb, bis zu ihren letzten Minuten schaffend und dichtend, den 19. November 1825 im 17ten Jahre. Zu den Gedichten der letzten Zeit gehört auch jenes merkwürdige „Traumgesicht nach meinem Tode“, in dem sie selbst ihren Tod beschreibt. Es ist vielleicht eines der erhabensten Meisterstücke der Poesie. So schied sie von uns, leicht wie ein Engel, der von einem Ufer zum andern übersetzt, aber in weithinleuchtenden Zügen die Spuren einer himmlischen Erscheinung zurücklassend. She died, writing poetry to the very end, on 19 November 1825, in her seventeenth year. Among her late verse is the remarkable ‘A Vision after my Death’, in which she describes her own death. It is, perhaps, one of the sublimest masterpieces in all poetry. Thus she departed, as airy as an angel passing from one shore to another, but leaving behind her the luminous trail of a heavenly vision, gleaming afar.